From the artisan studio of potter Colm de Ris comes this extraordinary hand-thrown and hand-built tableware. 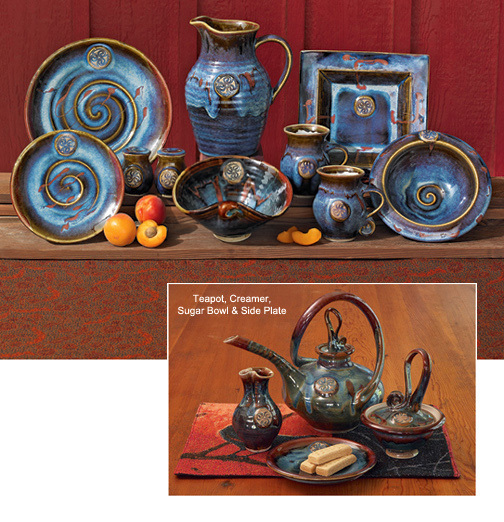 Luminous glaze in the deep blues, purples, and umbers of twilight, highlighted with touches of scarlet, melds with delightfully unexpected shapes, finely crafted, to transform your table into a work of art. Plates swirl to a central spiral, while the mug sports a handle curved to a spiral at the base. Curved bowl features a distinctive botanically-inspired shape. Round bowl has a wide rim with a triskele medallion. The square dish adds modern geometry to your place setting; it can also be hung as a wall decoration. Fill the pitcher with your favorite beverage, use to hold flowers, or just admire its artistic form. Salt and pepper set adds the finishing touch to your table. Teapot features a dramatically-swooped handle, echoed by the loop atop the lid. Each piece shows off the triskele medallion and is individually thrown and glazed; expect noticeable variation. Oven, microwave and dishwasher safe. Handmade in Dublin, Ireland. Gift wrap and rush delivery are not available. Save $100 when you purchase the 16-piece set of four place settings (plus $20 delivery surcharge)! The bowl is a nice piece of pottery to use when entertaining. I collect a dinner place setting from every country that we have traveled to. The Gaelic pottery place setting is stunning. It arrived very quickly and I have had many compliments on it. Beautiful dinnerware!! Customer services also wonderful! Will definitely order from Gaelsong again and highly recommend them. I ordered this mug as a gift for my daughter, and she absolutely loves it. It is beautiful and well crafted. Will definitely order additional pieces to add to her collection. Extremely pleased with the beauty and quality of this teapot! Love it! LOVE them ! They look just a beautiful in person! I started looking for a tea pot to place in our kitchen that would be a symbol of our love when we decided that after 6 yrs of dating that we would marry. We are both seniors, and after going thru some hard years and we both had lost our spouses to death. I had looked for a long time when I found this tea pot. We both fell in love with it, but just couldn't afford it at the time. What a shocking surprise when on our first anniversary this year, I opened my gift only to find this gorgeous tea pot. I jut started to cry. I want to leave the tea pot out on display on our stove, but I am so afraid it's going to get knocked over and broken. Do you have a matching saucer or something I can sit it on to make it more stable. Owner Response:Thank you for your review, Laura! We're so happy that you're pleased with this beautiful teapot. While we don't have a saucer or trivet specifically made to go under this item, there are matching plates which may fulfill your need. You can see them here: https://www.gaelsong.com/product/151222/decor-celtic-entertaining.